Mayrhofen is a community in one of Tyrol′s most picturesque corners. Therefore, despite of its rather small population of less than 4,000, Mayrhofen is a rather well-known place. Not only within Austria, but internationally: Both as a skiing resort during the winter season and as a hiking paradise during summer. This results in Mayrhofen ranking among Austria′s top 10 of the most heavily-visited places - not in visitors per capita, but in absolute numbers. Approximately 1.3 million night arrangements are sold in Mayrhofen every year. In terms of its location, Mayrhofen lies in the end of the Zillertal Valley, east of the Ziller River. The community has access to some of the highest mountains in the region, some of which are higher than 3,000 metres - these include Mount Ochsner, Mount Zsigmondyspitze, Floitenturm and the Großer Löffler. The latter one marks the border to Italy. With all the mountains around Mayrhofen, the community spreads over a rather large chunk of Tyrol. This makes it one of the biggest municipalities of the province - at least in terms of surface. The sheer size of the community and the tourism-friendly image of the Zillertal Valley is one of the reasons why Mayrhofen attracts so many visitors. Another one is that the town has managed to built up a reputation for medical conferences and conventions. The biggest of its kind is a meeting of anaesthesiologists that is held annually. The event has the pleasant and easy-to-spell name of "Repetitorium Anaesthesiologicum" and is considered to be among the most important European meetings of its kind. Being a scientist myself, I suspect the event to be a rather lame excuse for a (well-)paid vacation in the Tyrolean Alps. In terms of sightseeing, opportunities are rather limited: There are mountains, hills and more mountains. If you dislike both skiing and hiking, Mayrhofen is not your kind of place at any time of the year. Surprisingly, Mayrhofen does have a bit of history to offer. The first settlers in the area did probably arrive from the South. For more on this general part of the history, read my article on the Zillertal. The name of Mayrhofen relates to a "Meierei", an administrative court that belonged to the Prince Archbishop of Salzburg (again: please see the Zillertal article for further details on the Tyrol/Salzburg issue). The earliest records of Mayrhofen date back to 1200, when the village is mentioned in tax protocols of Salzburg. Things ran smoothly for the dead end of the Zillertal and history happened elsewhere. In 1801, Mayrhofen fell under the administrative control of nearby Pramberg. And following the political rollercoaster of the Napoleonic Wars and the Vienna Congress, Salzburg was secularized and the entire Zillertal Valley including Mayrhofen became part of Tyrol. 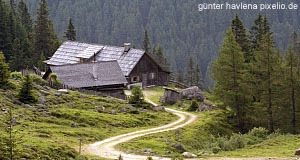 Soon after these events, tourism started to kick in: In 1879, the "Berliner Hütte" mountain cabin opened. Hiking became a fashionable thing to do even for city folk from Vienna and further cabins were to follow soon. In 1902, the Zillertalbahn, a narrow gauge railway, was opened. It finally made tourism a mass phenomenon and the days of remoteness were over. With the development of skiing lifts and the highway after World War II, the Zillertal turned into a tourism paradise. Since sightseeing in the strict sense of the word is pretty pointless in Mayrhofen, you are better advised to take advantage of the numerous cable cars and lifts that take visitors to the mountains. Attractions nearby include the massive waterfalls of Krimml in Salzburg; the National Park Hohe Tauern; the Lake Achensee; the villages of Rattenberg and Alpbach; and, a bit further away, the towns of Hall and Innsbruck.